Chocolate Covered Peeps make the perfect Easter dessert! Yes you can buy chocolate covered peeps in the store, but they are no where near as good as these homemade Chocolate Covered Peeps. As big peeps fans we love coming up with creative and tasty peeps recipes! There are so many fun things that you can make with peeps! If you are looking for more peeps recipes, be sure to check out the rest of our peeps recipes. These chocolate covered bunnies made with peeps are so easy to make and they look super cute too! 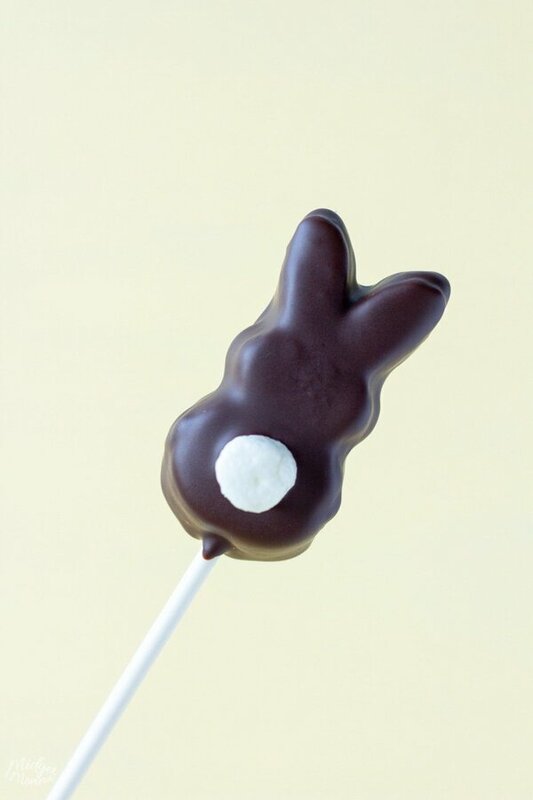 fter dipping the marshmallow peeps in chocolate, you will add a mini marshmallow on the backside that gives it a cute little “cotton tail”, that looks totally adorable! 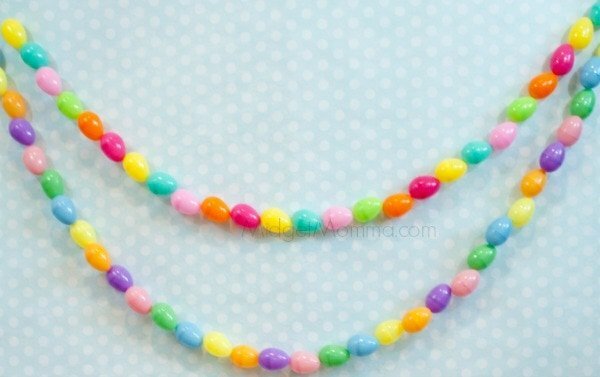 If you are looking for something to change up the kids Easter baskets, these are a great option! 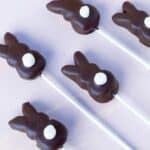 These chocolate covered peeps also make a great table decoration and dessert for your Easter dinner! 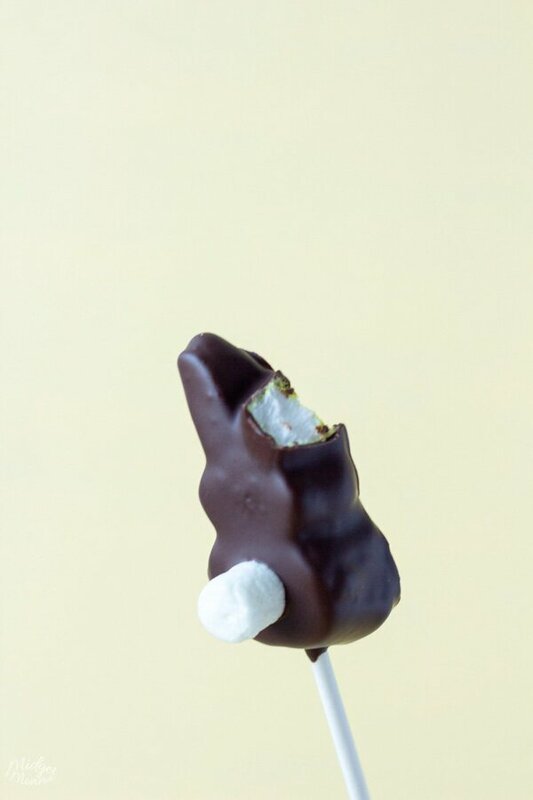 When you are making these chocolate covered peeps, I find they work best if you open the package the day before you plan to make them, this way they harden a little bit. If you are making these last minute, then you can pop them in the freezer as well. If you are like my mom and I then you like to open the package and let them harden before enjoying them anyway. 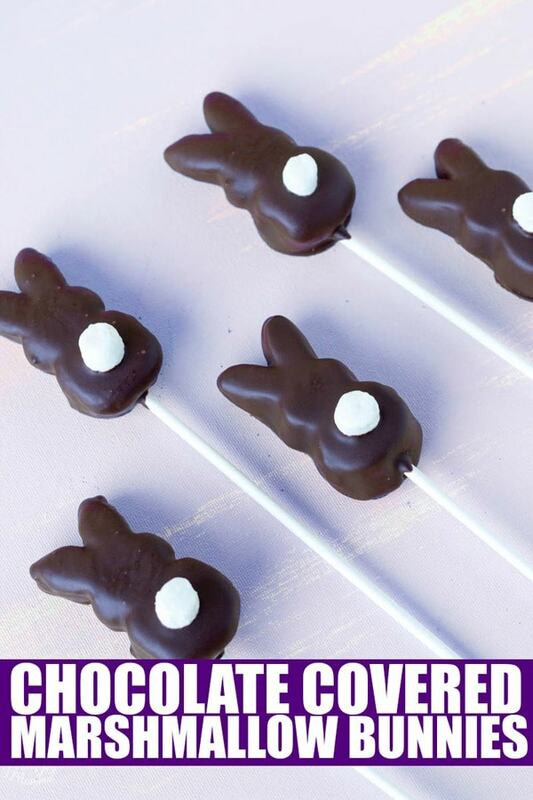 These Chocolate Covered Marshmallow bunnies only need 4 ingredients; marshmallow peeps, melting chocolate, shortening and mini marshmallows. If you have never used melting chocolate, there are two different ways you can do it. In a large microwave safe bowl add your chocolate and microwave it for 30 seconds at a time in the microwave until it is fully melted. The other option is to use a double boiler, you can find all the directions for How to melt chocolate in a double boiler, if you are stuck on how to do it. It is really simple to do, and I prefer melting chocolate with a double boiler over using the microwave because I have more control over it. You can buy chocolate covered peeps in the store, but they are no where near as good as these homemade Chocolate Covered Peeps. Line a sheet pan with a silicon mat or parchment paper. Melt your dipping chocolate, if it is to think add a little shortening till its the right texture. Dip the end of the stick into the chocolate ,than stick it into the end of the peep. Let the chocolate harden in the fridge for five minutes. 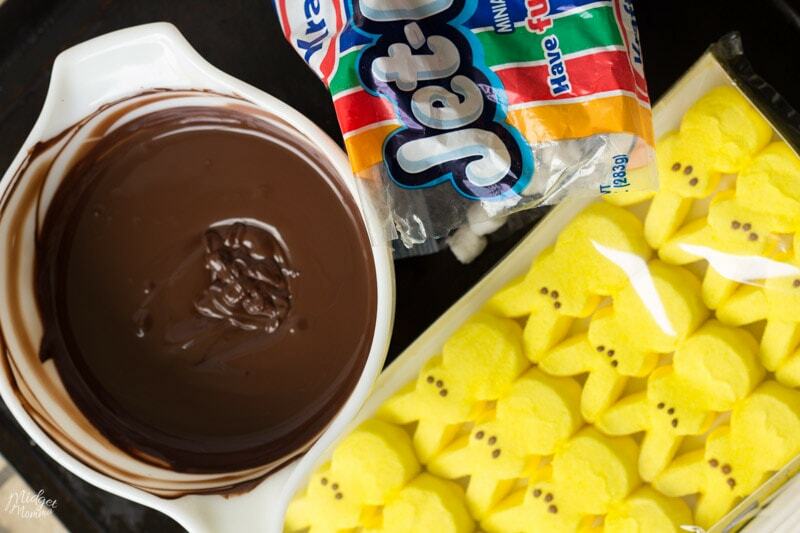 Dip the peep into the chocolate and tap the stick on the edge of the glass to remove the extra chocolate. Place a mini marshmallow for the tail. 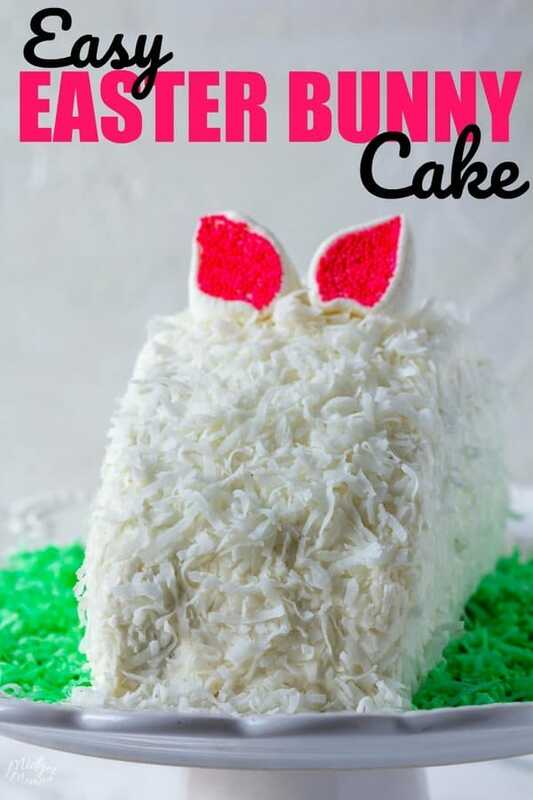 More Easter fun and Easter Recipes! What a nice way to make festive s’mores!